The regulatory burden on the pharmaceutical industry is growing on multiple fronts, from the phased requirements of the Drug Supply Chain Security Act to extensive requirements relating to electronic health records to proposed social media regulations from the Food and Drug Administration. Life sciences companies are actively communicating and collaborating with healthcare professionals and consumers through new communications channels, including social networks and instant messaging. These new communications vehicles make it increasingly difficult to remain compliant with data security, privacy, and information governance regulations. The industry is consolidating, with large-scale mergers between pharmaceutical giants and smaller integrations between drug manufacturers and software developers. New acquisitions require companies to marry legacy and current data repositories. 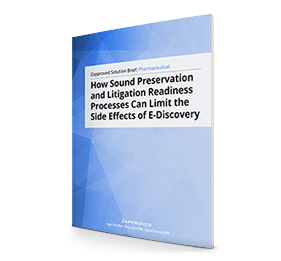 The rising cost of litigation, particularly ediscovery, is exacerbated for life sciences organizations because they often rely on specialized data repositories that contain sales, clinical trial, and adverse reaction information. Read the Zapproved Solution Brief for the Pharmaceutical Industry for insights about how to improve your approach to ediscovery and regulatory compliance. We’re here to help. Call us toll-free at (888)806-6750 or contact us.